They were correct, I loved his version and immediately began my search for this creative song writer. I found him online and we exchanged a few e-mails. I asked him if he would like to write a guest post for this blog sharing the behind the scenes story of how and why he wrote the song. Below are his words telling his story. But first, let’s all re live the “magic” of the song that went viral. Or in case you are the one person who didn’t see it the first time, watch below and then read his words. In case you can’t veiw the YOUTUBE video above, hit THIS LINK. The first time I heard the song Rude by the band Magic!, it was recommended to me by a friend but not because of the lyric, but because of the guitar tone on the solo. Its’ always about the tone. And he was right, the lead guitarist for Magic! has an amazing guitar tone. It was only after listening to the song a couple of times before I started catching the story in the lyric and more specifically, the “I’m gonna marry her anyway” line. The more I messed with it, the more I realized that what I was singing was kinda funny. So I looked the entire song lyric up online and downloaded Magic!’s version (paid for it…which by the way, if you’re not paying for music that you download, you are stealing it…rant over). 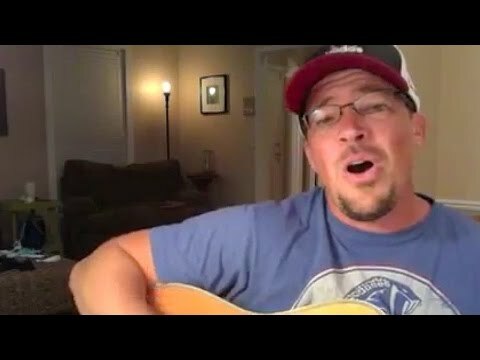 From there, I channeled my inner redneck and re-wrote the entire song to give a comically exaggerated version of a how the dad might respond to a young man saying “I’m gonna marry her anyway”. So as I write this blog entry, the youtube video that I posted of Rude (A Dad’s Response) has over 11 million views. In the two weeks after posting it, we were phone/facetime interviewed by multiple national news affiliates, the video has been shown on all kinds of major internet websites, and it even got played on Good Morning America. Maybe the most interesting part of this journey has been the conversation on the Youtube comments section (which I only recommend to a mature audience because it is not for the faint of heart). I have gotten plenty of negative comments ranging from young men outright challenging me to a fight, to other Christians calling me a hypocrite because I am claiming to be a Christian who is advocating murder. IT’S A PARODY PEOPLE!!! But there has also been an overwhelming amount of positive comments ranging from dads saying “Yes, I have a baby daughter but you just gave me a theme song for when she’s old enough to date” to comments from adult daughters saying “I am a divorcee and I wish my dad had stepped up like that when I was dating my ex-husband”. More importantly, with both negative and positive comments, there has been a conversation. A worthy conversation about dads and daughters and young men and respect. That conversation alone has made this whole thing worth it. As a dad, I will always protect my daughter. I hope I’ll never have to be in a situation where I’d have protect my daughter to the point of taking a life but I do know beyond the shadow of a doubt that I would give my life for that little girl. Hopefully, if I love her as I should and treat her like the treasure that she is, then the bar will be high for the kind of man that she will be drawn to some day. Benji can be found on facebook and I-tunes where you can enjoy other recordings of his muisc. If you want to look deeper into the convesation of raising a healthy daughter, pick up our book, “Prized Possession” by hitting the link below. We also have a fun store to pick up some Daddy/Daughter gear. I know he says it a parody but a Christian singing about hurting someone or killing them hurts the cause of Christ. He trampled over the verses about loving one another in this song and shows very little grace. Paul – you seem to be really struggling with lots of this blogs content…. You are certainly free to ask those questions of the author of that Parody. I can tell you that the Benji, the author is a worship pastor and has multiple recordings of worship CD’s…. He is certainly not advocating hurting or “killing” anyone…. it’s a joke…. just being silly…. although not everyone shares the same sense of humor.